The Blue Hawks enter post season play as the #6 seed in the tournament. We open tonight against #11 Spaulding. Interestingly, this is a back to back match as we defeated Spaulding in the last match of the regular season. 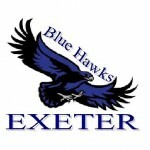 This is Exeter’s first home playoff match in some time and the girls (and coaches) are very excited! We are hopeful that the stands will be packed with “SUPER FANS” and they will be able to hear us all they way to Rochester!! First Serve at 6:00 pm – See you there!